The evening of November 9th brought the winners of the men's competitions together for the presentation of the trophies. In the chair was Club President Ann Saywell who welcomed the members to the event, sadly commenting that this would be her last "President's Dinner". The Grinham Greensomes trophy comes in 3 parts : the base, the cup and a metal net. After James unsuccessfully demonstrated his prowess as a juggler with the 3 parts Charles had to put it back together. A blast from the past no doubt with Dad fixing his son's broken toy! 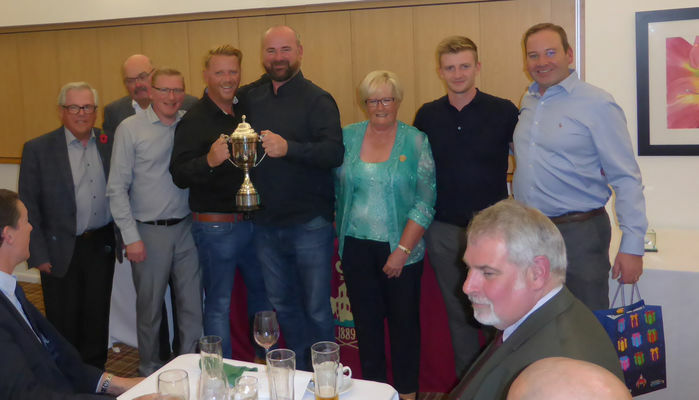 Following the Club Competition Trophy presentations President Ann presented a special trophy to George Halstead in recognition of his hole in one during one of the Junior Competitions. Finally, Dave Edgeller thanked President Ann for her hospitality that evening - having provided all the drinks - and for her sterling work as President. The members present rose to toast Ann - followed by prolonged applause.